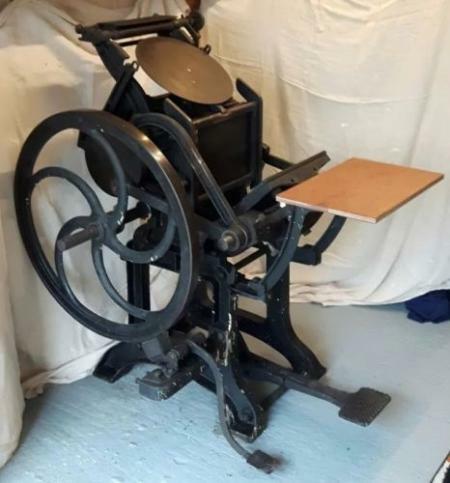 Does anyone recognise this press, which is currently for sale on ebay? When I first saw this on eBay I tried to identify it and had no luck. The square holes in the frame make it pretty unique in appearance. It is not a UK made press. I was interested in it, but actually looking closer there seems to be a bit of welding on broken cast parts. The owner says it has worked well for the 10 years they have had it, but then they would wouldn’t they! 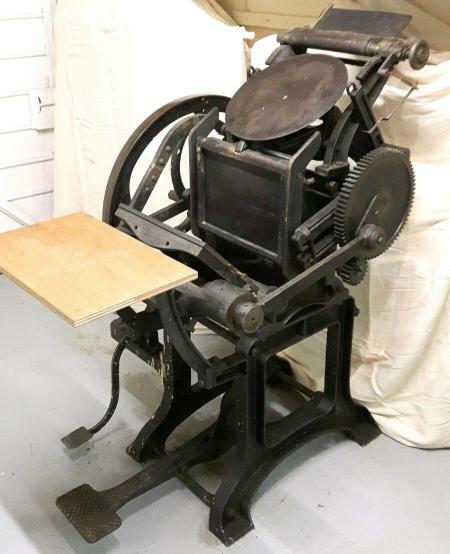 It has features very similar to a couple of presses built by John M. Jones in Palmyra, NY USA at different times, his Star, Lightning, and Clipper most similar. The large curved link on the left side is different, however. Several of the successful American designs were copied, with minor changes, in Britain and on the Continent, so comparisons aren’t easy. It’s an intriguing machine. That’s really interesting AdLibPress - I will look them up. I guess the proof would be to ask to see some examples of work they have produced on it? I can see the resemblance to the Jone Presses - I can only find a picture of the lightening. But yes, real similarities. Is there anything to watch out for when buying these unknown makers? I took the plunge and went and got the press. It’s a good solid lump of Victorian engineering, which needs a clean up and a bit of tlc, but is in good condition given its age. Photo’s attached, just in case anyone new to the thread happens to recognise it - there is no name that I have found yet. Just to round this thread off, here is a picture of the press now, having been restored over the last 5 weeks. The rollers are in good condition and of consistent width, but the trucks are worn with a very sloppy fitting onto the rollers. So I am making some new ones out of bronze. The roller shafts are a consistent .375”, but with scars from bits of grit or wear from the trucks, so I may have to sleeve those, but would prefer not to! Really please with how she has come out and looking forward to getting her printing. What happened to the foot brake? Thanks enriquevw - just not put back on yet. 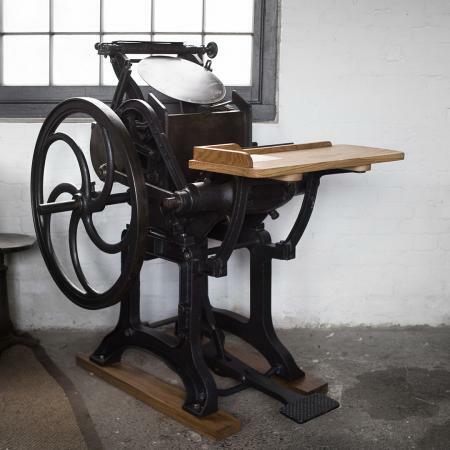 Actually I am surprised just how controllable the press is using the main treadle, I can easily stop it in the open position, which is good. Just a point of interest, the bolts are all BSW so that would suggest British made, however all the heads are slightly out for BSW - but I suspect that this is just a manufacturing fault/oddity, given it’s age. There is a lot of hand work on this (hammer marks etc), plus one or two bits that suggest they weren’t making them on a regular basis (oil holes in places where the shaft is actually fixed to the bearing/arm). I suppose we are looking at around 1870? What do you think?